With no offense to vegetarians, I admit that I have often had a love-hate relationship with wheat gluten products that try to masquerade as bona fide meat. I love the idea. But I hate the taste and texture, which have always seemed a true letdown. I can remember once going to a Chinese Buddhist restaurant with friends. After one of the dishes was set down at the table, my friend’s Dad dived in excitedly, then proclaimed that the molded, pressed wheat gluten slices tasted just like Peking duck. I almost blurted out, “Are you high?” But I managed to restrain myself and just smile in silence. Now, Veggie Grill is making me eat that thought. The first branch of the Southern California fast-casual vegetarian restaurant recently opened in San Jose’s Santana Row. As a local food writer, I received a couple of coupons to try a few of the entrees on the house. I went in with trepidation. But I came out a fan. Yes, even of the wheat gluten. I ordered a take-out order of the “Baja Fiesta Salad” ($8.95), adding grilled chickin’ ($2.75) to it, as well as the “Crispy Chickin’ Plate” ($9.95) and the Papa’s Portobello ($8.50) sandwich. Let’s cut to the chase. As you probably surmised, the chickin’ is fashioned from wheat gluten, soy protein, potato starch, carrot fiber, organic beet root fiber and seasonings. When it’s charred and cut into strips as it is in the salad, you’d be hard-pressed at quick glance not to mistake it for chicken breast. The strand-like texture does mimic real chicken pretty well. It has a mild savory flavor like poultry, too. 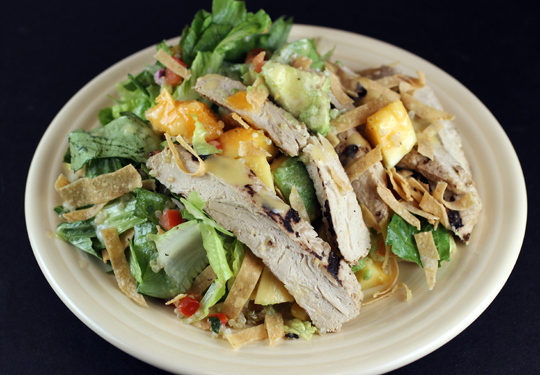 The salad is a mix of chopped romaine, roasted corn salsa, cucumber, cilantro, papaya and avocado. It’s fresh and crisp, with a tropical slant. The ginger-papaya vinaigrette was quite fruity, reminding me of a thinner version of lemon curd with its exceedingly bright sweet-tart taste. The chickin’ on the plate entree looked like an oblong hockey puck, but had a tender interior and a crisp exterior. 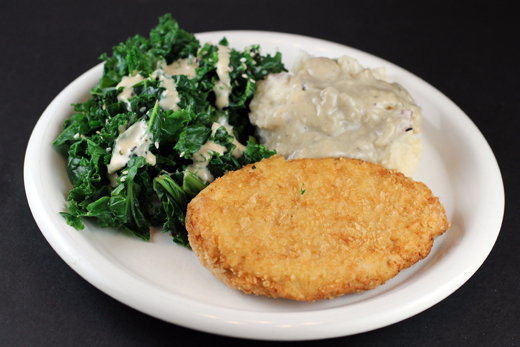 The cauli-mashed potatoes were chunky in texture with a flavorful porcini gravy to spoon over. The steamed kale on the plate may have been simple, but it had been cooked perfectly, with the leaves soft, but still keeping their integrity. The ginger-miso dressing on it was fabulous, so much so that I want to try to replicate it at home. Indeed, the dressings at Veggie Grill are true stars. They have a real pop of flavor with bold vibrancy. The portobello is grilled before being placed on a bun with tomato, basil and garlic sauce, pesto, caramelized onions, lettuce, red onion and chipotle ranch. It’s smoky, a little spicy, and quite satisfying. You get your choice of chili or cabbage slaw as a side. I chose the latter, which was a small mound of crisp red cabbage strands that was minimally dressed and tasted mostly of plain cabbage. 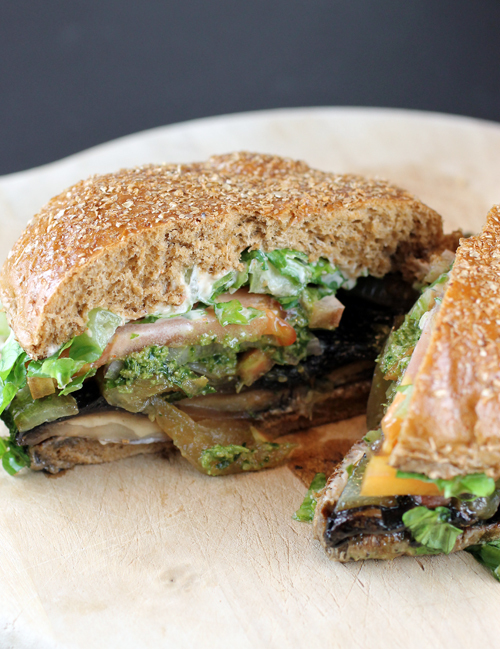 But that was fine, considering the portobello sandwich had so much going on already with all of its sauces. I can’t say I’m having a love affair with wheat gluten yet. But Veggie Grill has definitely opened my taste buds to the possibilities of one. CONTEST: Two lucky Food Gal readers will each win four ”free entree” coupons to any Veggie Grill in California, Oregon or Washington state. Entries, limited to those in the continental United States who have a Veggie Grill in their area, will be accepted through midnight PST Dec. 8. Winners will be announced Dec. 10. You’ve already read about my 180-degree reversal when it comes to wheat gluten, faux meat products. Tell me about a food or ingredient that you swore you hated, but then changed your mind about — and why. Best two answers win. 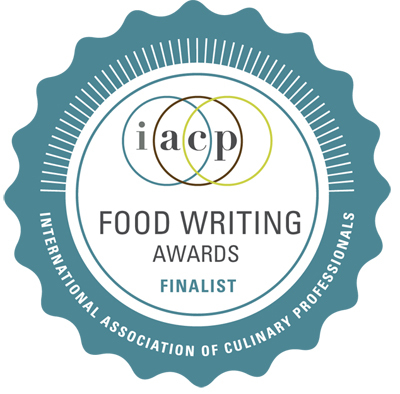 LAST WEEK’S CONTEST: In the previous Food Gal contest, I asked you to tell me about your favorite Middle Eastern food, ingredient or dish. 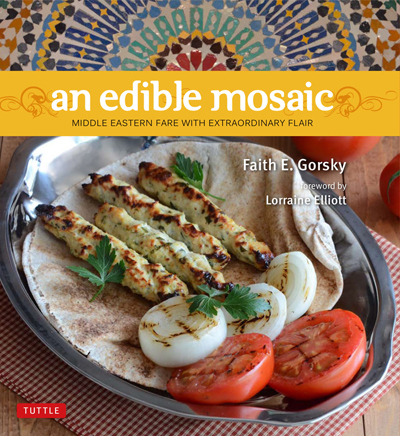 Best answer wins a copy of “An Edible Mosaic: Middle Eastern Fare with Extraordinary Flare” (Tuttle) by Faith Gorsky. Hmmm, interesting. I’m kind of in your camp about buddhist veggie food (basically just brown food), but I have been trying to be better at eating more vegetables and less meat (not morphing into a vegetarian at all). These dishes looks good, but I don’t get why they feel vegetarians want to eat food shaped as meat products? Does the vegetable salad really need to have strips of faux chicken for people to eat salads? And what’s with the need to make faux hamburger patties. Why not serve the ingredients it’s made from in its natural state? Ginseng is the quintessential “grown up” taste for Chinese-Americans. My parents would tell me I would understand its expensive, delicious, and sweet taste when I was older. I hated it in soup and thought it was bitter. Now, I can taste the golden sweetness at the end when I sip ginseng soup. I completely changed my mind about cilantro. I grew up in a very traditional midwestern town and the first time I tried cilantro was in college. The herbiness made me want to gag and I used to pick it out of the free salsa that restaurants would give!! When I started cooking myself, I was trying to expand my palate and so many of my friends LOVED cilantro so I decided to bite the bullet and try it again. HATED it again. I just kept at it. As my cooking improved, my hatred for cilantro lessened. I opened myself up to it and slowly things reversed and now I LOVE cilantro and throw it in generously to many dishes! It took time and patience but it really did happen. Some people still try to convince me that “studies show” some people physically cannot stand the taste of cilantro but I’m not buying it – I am living proof that a “hate” can turn into a “love”!! Interesting. 🙂 I’m a meat lover but somehow managed to love those Asian style wheat gluten fake meat at the same time. 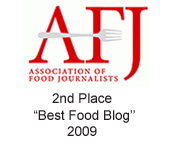 Unfortunately, I have yet tasted a good veggie burger though. They’re always on the dry and bland side. I gotta check out this Veggie Grill place. The ingredient I swore I hate & now love is Persimmons. I tried the Hachiya Persimmon once when it wasn’t ripe & thought why would anyone eat a mouthful of cotton balls? But, reading later on that you have to eat them water balloon soft & just Love the sweet & gooey taste. I eat them super ripe over the sink, in persimmon cake & cookies, with a salad. Just yummy! Best thing in the Fall/Winter & I just love this time of year! I’d have to say oysters. I was fearful for so long of those gooey orbs. Then I got bold and tried soup with one perfectly poached oyster and it was the best thing ever. The texture was so interesting! 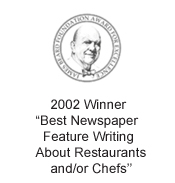 I approached raw – granted, they were at Bouchon so super top quality – and that chestnut is true “they taste of the sea”. Then of course a N’awlin’s po’ boy….bring them on! The ingredient I swore I hate & now love is White Onions. I didn’t like cutting them making me cry, taste of raw onions made my throat itchy. But, I learned that I didn’t mind grilled or cooked onions, now I can eat them with burgers & chow fun. Growing up I absolutely hated eating cabbage and couldn’t understand for the world why anyone would eat such a vegetable which basically turned to a glob of curry in Indian food. That was until I discovered red cabbage and the savoy cabbage in farmers Markets.The Red cabbage is nutty flavorful and extremely healthy!Savoy cabbage is awesomely flavorful just grated and tossed with lemon and pepper!